Project Details The Orathupalayam Dam was constructed on the Noyyal River in 1991 to irrigate 203ha in Erode district and 4000ha in Karur district. But instead of serving its purpose it became a storage tank for wastewater as the textile units started releasing their effluent into the dam’s reservoir. This effluent could neither be discharged into the river nor be stored due to percolation and contamination of groundwater aquifers. The effect of pollution was noticed when there was great economic loss for farmers in the downstream areas of Erode and Karur districts, in addition to contaminating the river Cauvery River. Why? Explain briefly. 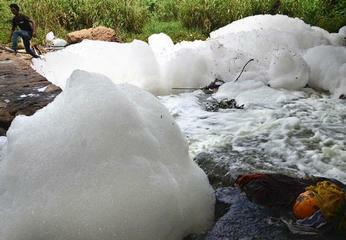 Industrial waste continues to be released into the waterways of the Noyyal River Basin. Jayanth Sarathi, N., Karthik, R., Logesh, S., Srinivas Rao, K. and Vijayanand, K. ‘Environmental issues and its impacts associated with the textile processing units in Tiruppur, Tamilnadu’, Second International Conference on Environmental Science and Development, 2011. Akilan, S. T. 'Textile pollution and sociological implications: A case study in the selected villages of Noyyal River belt, Tamil Nadu', EPRA International Journal of Economic and Business Review; Vol 4, Issue 2, February 2016. Jayakumar, N. and Rajagopal, A. 'Noyyal River Basin: Water, water everywhere, not a drop to drink', Water conflicts in India: A million revolts in the making, 2007. Other Comments Siruthuli (A Tiny Drop) is a trust formed of businesses from Coimbatore. In 2012 it proposed the 'Restore River Noyyal' project, which commenced in 2016. "River Noyyal in Coimbatore had 34 streams which helped it to flow perennially. Today only four exist," the trust says. "Siruthuli has mapped the entire river and its streams. Once the streams are cleaned and restored, the river shall flow once again." The project is expected to cost more than US$25 million.